We’re introducing a series on the Global Basecamps’ blog highlighting travel experiences that we feel are bucket list worthy. This week we’ll be highlighting the Galapagos Islands, one of the world’s best wildlife and nature destinations. Galapagos tours are truly once in a lifetime experience, where you’ll discover the island’s fascinating volcanic geology, unique flora and fauna, and breathtaking wildlife. The Galapagos Islands are a great destination to visit year round. Peak tourist season is from December through mid January and mid June to early September. From December to May the water and outside temperature are warmer, though there is more rain during this period. You will experience light, short rains almost daily. The warmer water temperatures make swimming, snorkeling, and diving more comfortable, though there are fewer fish to see during these months. Sea lion mating season also falls during this time and in March and April you can see many newborn sea lions. February to April is a beautiful time of year to visit the islands, as all the flowers are in bloom creating a colorful landscape. From June to November the water and temperatures are much cooler. This attracts more fish and birds. It can sometimes be cloudy or windy during this time of year, though there is little rain. This is a great time of year for diving; you can see more fish and penguins. Keep in mind the ocean is not as clam during these months. The ideal time of year to visit depends on your specific travel goals. With warm weather from December to May and more wildlife viewing from June to November both are great times of year to visit. There are a variety of Galapagos cruise options ranging from budget to luxury, and lasting from three to eight days. The cruises include all meals and excursions. Our first class yachts have no more than twenty guests and multiple decks with spacious rooms. 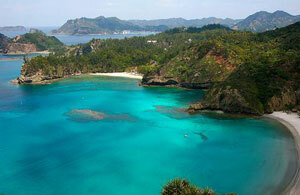 The itineraries include plenty of times on the islands for interaction with the wildlife. Our tourist class cruises offer a more affordable option, without sacrificing comfort. The tourist-class ships host no more than sixteen guests, with private cabins and ten suite facilities. Common areas include a dining room, bars, and conference areas. 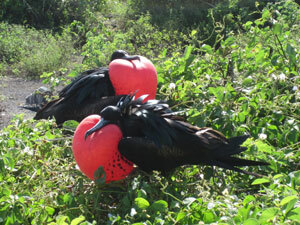 Another option for exploring the Galapagos Islands is on a land-based expedition. Our walking tour was developed in participation with the local community and explores the relaxing Isabela Island. Isabela’s attractions include 5 active volcanoes, wetlands in the archipelago and a beautiful beach. Activities consist of trekking with giant tortoises, swimming with white-tipped sharks, snorkeling with turtles, and kayaking amongst flamingos. This ecotourism adventure is one you won’t soon forget! If you’re looking for a luxury land based option the Galapagos Safari Camp is an ideal accommodation choice. The tented camp, modeled after an African safari camp, enables guests to stay in complete comfort while remaining close to nature. The safari camp sits on a 55-hectare farm in the highlands of Santa Cruz Island, on the border of the national park. The farm has an abundance of birdlife and beautiful scenery. One of the highlights of the Galapagos is the fascinating variety and abundance of wildlife. Isabela, the largest of the Galapagos Islands, has the most tortoises of all the islands and as a result of the topography several sub species of tortoise have developed. Santa Cruz Island, the second largest of the islands, is also where you’ll find wild tortoises roaming freely. On the north shore of Santa Cruz is Black Turtle Cove where you can encounter the graceful marine turtle while snorkeling or diving. Other marine creatures in the Galapagos include fish, sharks, eels, rays, dolphins, and more. There is a plethora of land and marine iguanas, which turn a bright red during mating season, throughout the island. Fernandina Island is home to a variety of species including marine iguanas, the flightless cormorant, sea lions, marine turtles and penguins. 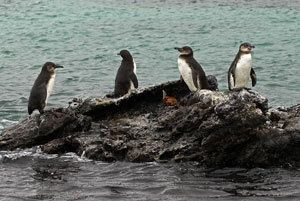 The Galapagos is the only place penguins are found in warm waters. Isabela and Fernandina have the most penguins, so be sure they’re included in your stops if you’re hoping to see one! The variety of colorful bird life on the islands includes blue-footed boobies, the frigate bird and finches, among others. Genovesa Island has an abundance of frigate birds, red-footed boobies, and swallow-tailed gulls. Española Island, located in the southeast of the archipelago, has one of the most diverse colonies of sea birds in the Galapagos. The most famous mammals to see on the Galapagos are the sea lions and fur seals. You can be entertained for hours watching these playful creatures swim and waddle on land. A highlight of visiting Santiago Island is seeing the fur seal cave. The northern beach of Bartolome Island is popular for swimming with fish and sea lions, though there will definitely be no shortage of the inquisitive creatures throughout your cruise. The Galapagos Islands consist of 13 main islands, 17 smaller islands and many small islets. The islands are home to a large number of endemic species and no matter where your cruise or tour ventures, you are bound to experience an incredible variety of wildlife and nature. We have hand picked the most eco-friendly and sustainable ships on the water. With a variety of options to choose from, our Galapagos tours are designed to match a variety of travel styles and goals. Read our Guide to the Galapagos Islands on Beers and Beans for information on where to stay, activity options, what to pack, and much more!